Based on dual-band AC3200 MU-MIMO , DFS Wi-Fi Technology LinksSys operates on 802.11a/b/g & n network standards with Wi-Fi bands on 2.4GHz and 5GHz covers around 6900 Sq. Ft. with the achievement of Dynamic Frequency Selection (DFS) certification by the FCC , Linksys WRT 32x Gaming router allows Wi-Fi devices to use the 5 GHz channels. WRT32X is engineered purely for gaming, provides a dominating home network. We can achieve best advantage in MOBAs, shooters, and other games where a single millisecond can mean victory or defeat. The intuitive interface manages home’s Internet traffic. we can monitor connected devices, manage advanced networking settings, and conduct speed tests with-in a few mouse clicks. To make sure the optimal performance, this gaming router comes with the gaming-focused UI dashboard, we can check network traffic speeds, check VPN and network storage status and controls port-forwarding. It is obvious that with the invent of MU-MIMO , thing are revealed with the quality of service as now wireless devices are working with the best signals . 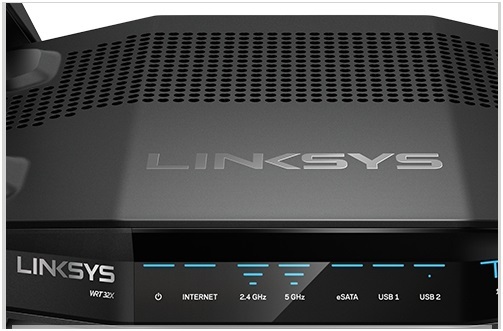 But still the best way to connect gaming zones over internet is the Ethernet and Linksys assembles with the Linksys WRT32X. The coverage with 2.4 & 5 GHz is optimal even in with congested and multi-story buildings while the speed goes to 2600Mbps on the 5GHz network and 600Mbps on 2.4GHz network.